Piasecki X-49A Speeedhawk Compound Helicopter: 250-mph Black Hawk? | DefenseReview.com (DR): An online tactical technology and military defense technology magazine with particular focus on the latest and greatest tactical firearms news (tactical gun news), tactical gear news and tactical shooting news. Piasecki Aircraft Corp. (PAC) has designed and developed a compound helicopter called the X-49A Speedhawk, which utilizes a Sikorsky YSH-60F Seahawk helicopter as the base airframe. The Seahawk is a marine version of the UH-60 Black Hawk heliocopter series. The Speedhawk’s “compound” aspect is comprised of wings for additional lift and a vectored-thrust ducted propellor (VTDP) for additional propulsion and control, the whole idea of which is to make the helicopter significantly faster so it’s correspondingly significantly harder to hit from the ground by the enemy. A faster helo means less time for the enemy to react and target it. In forward flight, the Piasecki VTDP system provides significant forward thrust power while the wings take on a significant percentage of the lift role, so the helicopter is no longer relying solely on the main rotor for both functions. In other words, the main rotor gets a lot of help, so the helicopter can fly much faster with less effort. The vectored-thrust aspect handles the anti-torque/anti-rotation role of the traditional rear rotor blade while in hover mode. The Piasecki-Sikorsky X-49A Speedhawk VTDP tech demonstrator has already flown over 200 mph, albeit in a “slight descent”. It accomplished this feat during a flight test on October 08, 2007. The Speedhawk achieved a speed speed of 177 knots, which translates to 203.69 mph. Not bad, but since the non-compound/standard SH-60 Sea Hawk Helicopter’s top speed has been listed at 180 mph, we’re guessing that a compound version utilizing the same airframe–like the Speedhawk VTDP compound helicopter, for instance–once fully-developed, will be able to fly significantly faster than that. We’ll just have to see. Oh, and there may be an added benefit from the Vectored-Thrust Ducted Propellor in the form of less noise generation. DefenseReview will research this, and try to find out how the reduced-noise effect (if any) compares to NOTAR (NO TAil Rotor) helicopter design. In the meantime, the Speedhawk looks promising. And for that matter, so does the concept of compound helicopters for military/warfare applications. DefenseReview has actually been a fan of the compound helicopter concept ever since we started researching its use for attack helicopters. The compound attack helicopter concept is perhaps best represented by the Lockheed AH-56A Cheyenne compound attack helicopter program. The Cheyenne offered speed and flight capability advantages that remain unmatched even by the latest Boeing AH-64D Apache Longbow and Bell AH-1Z Super Cobra attack helicopters. The kicker is, right before the U.S. military cancelled the Cheyenne program, the engineers had apparently already worked out all the bugs. Cheyenne was viable. 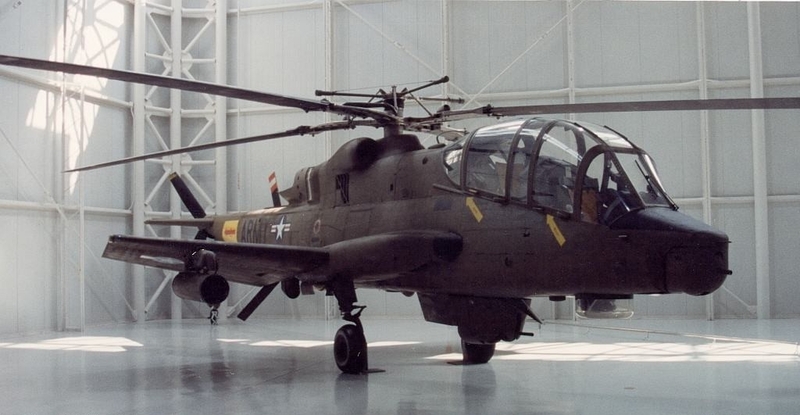 The Cheyenne compound attack helicopter / combat helicopter sported some interesting hardware, including a rigid main rotor, a pusher-prop, an advanced navigation and fire control suite, and a 360-degree under-belly gun turret a.k.a. “swivelling gunner’s station”, among other things. Maximum and cruising speeds for the Cheyenne have been listed at 244 mph and 225 mph, respectively, by other sources. It would be interesting to see an updated version of the Cheyenne outfitted with the Piasecki VTDP system, which should be a lot safer and quieter than the pusher prop. DefenseReview plans to publish follow-up articles on both the Piasecki X49A Speedhawk VTDP and AH56A Cheyenne helicopters, as well as compound helicopters, in general. Next: HK416/17 vs. FN SCAR-L/H: Which System is Superior?